Rock Hard Cherokee XJ Rear Bumper/Tire-Carriers are made out of 3/16" x 2" x 4" thick tubing in the center and with outter edges that are made of 1/4" plate. This bumper also comes with (2)-5/8" x 2-1/2" CNC D-Ring shackle mount with tabs that are welded on front, go through bumper and then welded on the backside too. A horizontal Hi-Lift Jack mount with padlock provision comes standard as well as a 2" receiver for towing. The swing out tire carrier will hold up to a 38" tire. All needed hardware is furnished for installation. Midwest Jeep Willys is very selective in the Jeep aftermarket accessories we sell. 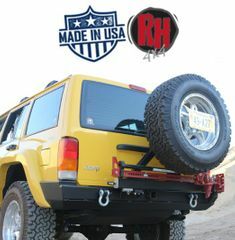 We believe that Rock Hard 4x4 Jeep products are one of the best on the market today. Excellent quality, reasonably priced and best of all made is the USA.